In the summer of 2009 a corner of The Wildgoose Memorial Library materialised in a specially built room within the Institute for Contemporary Art at Maine College of Art, Portland, Maine, USA. 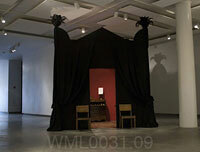 Devised by Jane Wildgoose, and co-curated by Rebecca Duclos and Lauren Fensterstock, the outside of the room was sumptuously draped in black fabric and surmounted with ostrich feathers, inspired by the elaborate funeral car that carried Nelson's coffin on the final part of its journey to St Paul's Cathedral, in January 1806 (see: nationalarchives.gov.uk). Inside the temporary WML outpost Jane's black and white photographs (taken along the route of the River Thames on which Nelson's body was transported by barge from Greenwich where it had lain in state, for interment at St Paul's) were hung on deep crimson walls. Small cabinets displayed mourning relics and hair jewellery, along with books and memorabilia relating to Nelson and his lover, Emma Hamilton, to whom the Hero of the Battle of Trafalgar bequeathed all his hair as he lay dying on board the battleship Victory. On a bureau containing postcard reproductions of Johann Heinrich Schmidt's pastel portraits of Nelson and Emma, a 1930s radio played continuous performances of One Lost Hair, interspersed with the sound of the sea. Also included in the display was a copy of the miniature coffin, modelled on the decorated original made for Nelson's funeral, fabricated by Jane for On One Lost Hair to house a tiny relic purchased from eBay on a final voyage down the River Thames. On One Lost Hair was first broadcast on BBC Radio 4 in 2004, and was co-devised with producers Gregory Whitehead and Neil NcCarthy. On One Lost Hair is an anagram of Horatio Nelson.